The Snug is a comfortable double bedroom with its own en suite shower/toilet and separate outside entrance. It is located in between our other 2 properties and is often booked as an extra bedroom along with one of our properties. Its ideal if granny and grandad are coming along on the family holiday but want somewhere to escape too. 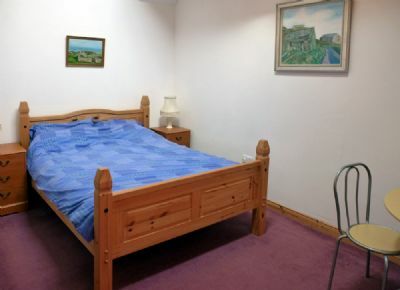 It can also be booked on its own and is equipped with tea/coffee making facilities, a small mircowave and toaster. There is no TV in the snug so its a real chance to get away from it all.